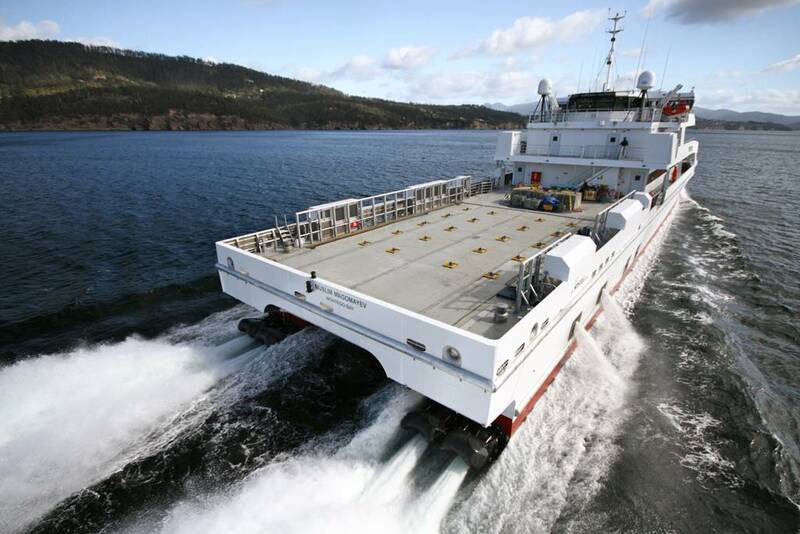 The world’s largest Fast Crew Boat has recently been launched by Incat Tasmania’s shipyard on the 15th of September 2014. This DP2 class 70m Fast Crew Boat (FCB) will be operating as a fast crew transfer vessel to various installations in the Caspian Sea and has a semi-SWATH hull design with active ride control, which will provide a more comfortable ride and reduce stress on the crew and passengers. Named the ‘Muslim Magomayev’ the boat has approx. 200 metric tons deadweight and is capable of carrying 150 passengers and 14 crew, along with 130 metric tons of deck cargo, in up to 40 knot wind and seas of up to 3 meter wave heights. Powered by 2,880 kW MTU engines driving quad HamiltonJet HT900 waterjets the boat is designed to achieve a maximum speed of 36 knots and a service speed of 30 knots. In the recent sea trials the vessel achieved 38.7 knots lightship. HamiltonJet’s Systems Engineer, Aidan Priestley says “we are very pleased with the commissioning of the boat, the shipyard has done an excellent job with the installation and the system integration has been seamless and without faults.” The HT900 waterjets feature a mixed flow pump that provides high efficiency at medium to high speeds and retains the high thrust at zero speed required for Dynamic Positioning in high sea states. A new optimised compact astern deflector retains the performance of the HamiltonJet split reverse duct system, but with reduced weight and width for installation in narrow hulls. The deflector is actuated by two fully inboard hydraulic cylinders. HT waterjet models are fitted with the class leading JT nozzle steering system, also actuated by two fully inboard hydraulic cylinders which allows for minimal thrust losses whilst responding to steering demands. This Fast Crew Boat is controlled by four bridge operating stations provided by the HamiltonJet MECS control system. This is seamlessly integrated with the boat’s DNV DYNPOS-AUTR dynamic positioning system, which will provide station keeping and improved safety during crew transfers using the Ampelmann ‘walk to work’ passenger transfer system. Each control station consists of a twin throttle and reverse levers, and a steering device with the port and starboard bridge stations also featuring a manoeuvring joystick. All stations are interfaced through the appropriate HamiltonJet modules to the voyage data recorder, autopilot, DP System and the monitoring system.